The departure of our beloved mother Mrs Krishna Arora is a personal loss to us. Though it is a great loss to our whole family yet she has left a deep touch of love to all of us and is a source of courage and dedication. It was no age for a person like her to depart. She was active, dedicated, selfless and a simple but pure soul. She inspired everyone who met her to live gracefully. She was a great spirit to be cowed down by any hardship, but the disease which snatched her from us has become a menace for mankind. Once it was detected that breast cancer was affecting her body, we took her to every expert doctor in India as well as USA, but was of no avail to help her fight a winning battle. Though she braved every difficulty caused by disease but in the final round disease took her away from us. It happened because disease was detected at late stage. In her death she had left an important message with us, that people must be made aware that in the beginning the disease is not that dangerous as it becomes in the second and third stage. Let us learn from her sufferings and make sure we get our self tested regularly and avoid being caught by this disease at an later stage when it is too late. 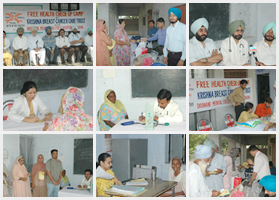 Copyright ©2012 Krishna Pran Breast Cancer Care Charitable Trust. All Rights Reserved.